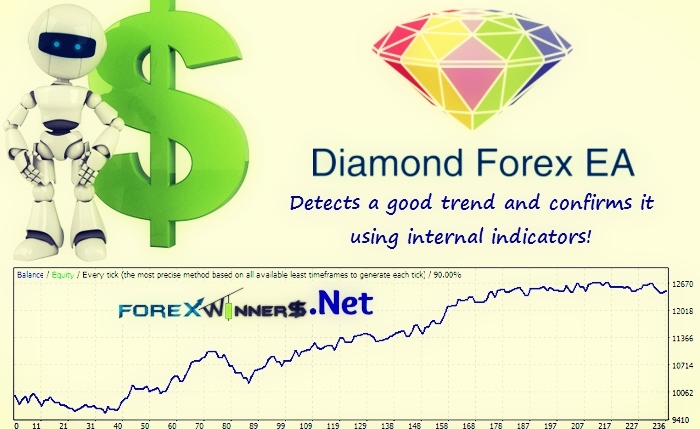 The Trading system of the Diamond Forex expert advisor is based on several accurate Forex indicators. The system detects a good trend and confirms it using internal indicators, then opens the trades to make maximum profit for you. Diamond Forex expert advisor monitors each open trade carefully and closes it at the correct take profit level.And it works on H1 time frame for all forex pairs. • More Safe. Diamond Forex expert advisor uses a fixed stop loss value so your possible losses will be small and limited. A great number of additional safe filters and indicators were added to prevent trading in risky conditions. • More Profitable. Advanced filters and indicators that were added to the system make sure Diamond Forex expert advisor avoids risky periods with unstable market conditions and makes the most of the profitable trades with high accuracy. To perform a backtest, you should press CTR+R or View->Strategy Tester in main menu in Metatrader4. Then select the expert advisor to backtest, the proper currency symbol, time interval (Use date), period. Click OK. When the backtest is finished you will see the results in“Results” or “Graph” and “Report” Tabs below.